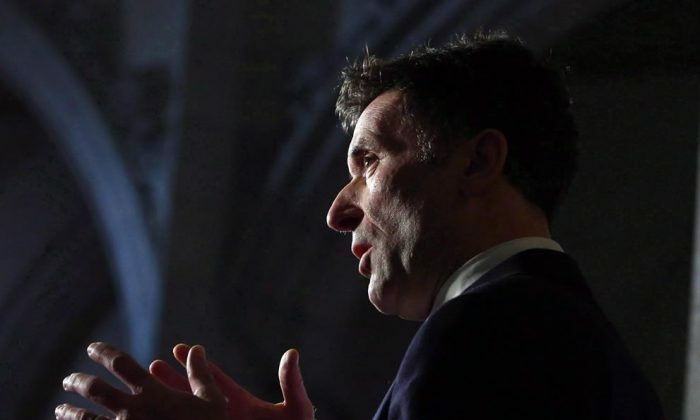 OTTAWA—Paul Dewar, a teacher and union leader from Ottawa who became the New Democratic Party’s foreign−affairs critic, died on Feb. 6 after contending with brain cancer for a year. Despite struggling with dyslexia as a child, getting trounced by Ed Broadbent during his initial foray into politics, losing his seat in the House of Commons in the Liberal wave of 2015, and being diagnosed with a terminal illness, the 56−year−old was infused with a positive, hopeful attitude and belief that the world could be made a better place. Dewar is perhaps best known for having served as the MP for Ottawa Centre from 2006 to 2015, much of which he also spent as the NDP’s foreign−affairs critic, following an early career as an elementary−school teacher and union executive. Whether it was the war in Afghanistan, free−trade deals, or the defence of human rights and democracy in developing countries, Dewar was fierce in his convictions but also willing to listen to differing viewpoints to try to find a consensus. Dewar’s path into politics meant following in some pretty big footsteps. His mother, Marion Dewar, was not only one of Ottawa’s most beloved mayors but also a heavyweight in the federal NDP and social−activist circles in the 1970s and ’80s. Then there was Ed Broadbent, the legendary former NDP leader whose short−lived political comeback started by trouncing Dewar during the latter’s first nomination battle in 2004. Dewar had been campaigning for the nomination when Broadbent decided he wanted back in. Former political opponents praised him on Feb. 6. Many might not realize that Dewar was dyslexic. Dewar credited the disability, which makes it harder to read, write, and sometimes speak, with having made him more resilient as well as a better teacher and politician. Then came the diagnosis in February 2018 that he had Grade 4 glioblastoma, the same type of brain cancer that killed Tragically Hip singer Gord Downie (and on whose birthday he died). Dewar had gone to the hospital when he felt numbness in his arm that didn’t go away — a bother he’d at first put down to being tired from a 36−kilometre skate on the frozen Rideau Canal. That’s five full lengths of the skateway that runs not far from his downtown Ottawa home.